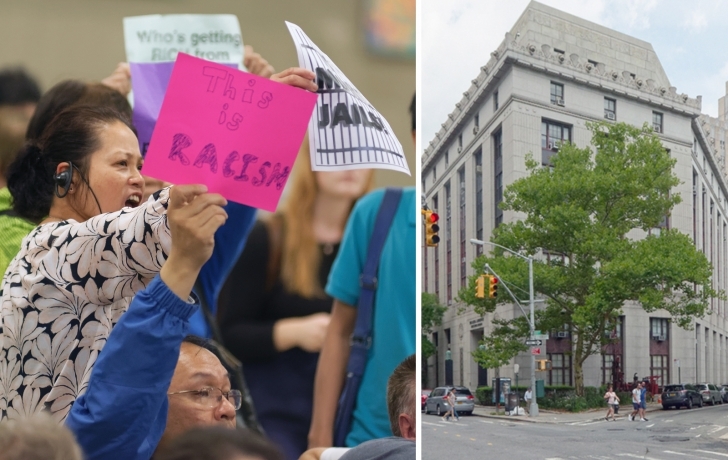 After facing a wall of resistance against its plan to build a 40-story jail at 80 Centre Street, the de Blasio administration has scrapped the idea. The city announced Wednesday that it will return to its original proposal to redevelop the current Manhattan Detention Center at 125 White Street as part of its initiative to close Rikers Island and create borough-based jails. “As we met with the community, it became clear that the original site we considered better addressed their needs without the costly challenges created by using 80 Centre, and we are reverting our site selection to the Manhattan Detention Complex,” the mayor’s deputy press secretary, Natalie Grybauskas, said in a statement. City offices, including the Marriage Bureau, are housed in 80 Centre Street and they would have needed to be moved. “We found that the challenges associated with relocating various offices at 80 Centre Street would make siting a jail there far more complicated and more costly than we originally anticipated,” Grybauskas noted. Administration officials did not give details on the new facility at 125 White Street or say when they will be released. A draft study of the environmental impacts of a 432-foot-tall jail at 80 Centre Street as well as new jails in Brooklyn, Bronx and Queens (none are planned for Staten Island), was to be released next month. Officials said the environmental review period will be extended a few months. “We will use this time to continue to engage the community,” Patrick Gallahue, a spokesman for the Mayor’s Office of Criminal Justice, said in an email. “By focusing the conversation on this existing detention site, we can ensure that this facility remains near the courts, and Columbus Park will no longer be placed under the shadow of a proposed 40-story jail at 80 Centre Street,” Chin also said in the statement. The prospect of a sunless Columbus Park was among many worries expressed by opponents of the plan, especially those living in Chinatown. In three boisterous public meetings, residents said they feared the impact of the towering jail on the neighborhood’s economy as well as traffic, air quality from construction, and crime. “What I wouldn’t want to see is that this is the start of kicking the can down the road,” Nims added. “There is an urgency to get this done. Editor's note: An earlier version of this story incorrectly identified mayoral spokesperson Natalie Grybauskas as Adrian Untermyer.